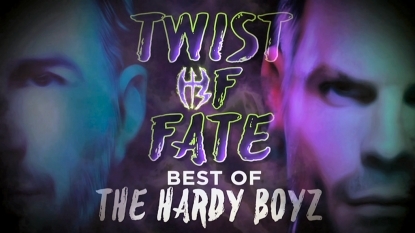 It is DELIGHTFUL to be able to report that WWE is less than 2 weeks away from releasing the new “Twist of Fate: The Best of the Hardy Boyz” DVD! The 3-disc DVD set will reach fans in the United Kingdom first on April 30th and will follow one day later to the United States on May 1st, packing in 27 matches spanning the entire WWE careers of the Hardys along with new segments filmed with Matt and Jeff at the Hardy Compound. The web was WOKEN this time last week with the announcement that this very Home Video release on the Hardy Boyz would be the first ever to include footage from Impact Wrestling (TNA). WWE Home Video UK revealed that WWE and Impact Wrestling had collaborated on the project in order to give us an expanded look at the “Broken Universe” – and by the looks of it that means TNA footage of the Hardys will appear not only on this DVD but also on the WWE Network. We’ve checked out an advance copy of “Twist of Fate: The Best of the Hardy Boyz” and can confirm that the TNA footage is there! WWE shows clips of Matt and Jeff in TNA while the duo discuss their highlights working for the company, with particular attention on the “Broken Hardys” gimmick and “The Final Deletion” match. – UK/Europe: April 30th. Pre-order a copy of the Hardy Boyz DVD now on Amazon.co.uk. – USA: May 1st. Pre-order the new Hardy Boyz DVD right now here on Amazon.com. – Australia: June 20th. Your pre-order opportunity has now landed over at Madman.com.au. Earlier this week we got eyes on the official cover artwork and a first list of matches planned for “Then, Now, Forever: The Evolution of WWE’s Women’s Division”. Below is another new shot of the cover, now updated with the spine artwork revealing that Sensational Sherri, Trish Stratus, Lita, Ronda Rousey, Sasha Banks and Carmella will be featured there. More WWE DVD artwork has come through for you now, this one is the box art for the US version of “Randy Savage Unreleased: The Unseen Matches of the Macho Man”. And that should mean Amazon’s pre-order listing for the United States should surface any day now! 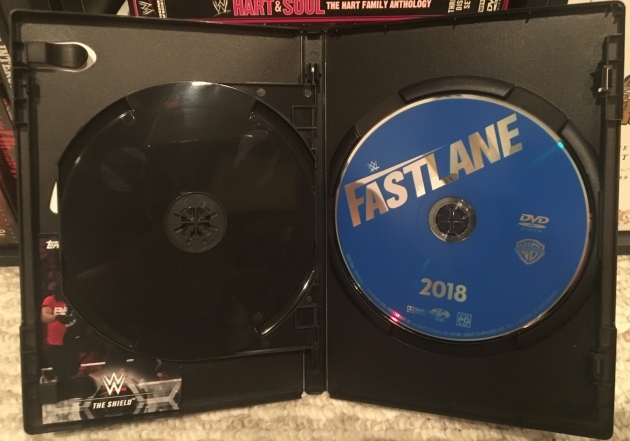 Heads up, WWE’s new “Double Feature: Elimination Chamber & Fastlane 2018” DVD officially hit stores across the United States yesterday (get your copy) and this will be the final “Double Feature”, a series that began with the Elimination Chamber and Fastlane PPVs of last year. The 2018 events were of course the last stops on the road to WrestleMania 34 and featured action like the first-ever Women’s Elimination Chamber Match, the seven-man Elimination Chamber Match, Ronda Rousey’s contract signing, and the Six-Pack Challenge for WWE Championship. Inside the last of the “Double Feature” packs you will find a trading card of The Shield and, oddly, one of the discs is labelled “Region 1” format while the other is labelled “All Region”. Thanks for the pics, WDN reader Matthew Tremble! The Women’s Evolution steps inside the confines of the Elimination Chamber for the first time in WWE history! Alexa Bliss defends her RAW Women’s Championship against Sasha Banks, Bayley, Mickie James, Sonya Deville and Mandy Rose. In the biggest Elimination Chamber Match ever, Roman Reigns, John Cena, Seth Rollins, Finn Bálor, Elias, Braun Strowman and The Miz battle it out to decide the challenger for Brock Lesnar’s Universal Championship. Plus, more! The Superstars of RAW put it all on the line at Elimination Chamber! AJ Styles tries to clear his path to the Showcase of the Immortals when he defends the WWE Championship in a six-pack challenge match against John Cena, Baron Corbin, Kevin Owens, Sami Zayn and Dolph Ziggler. SmackDown’s Women’s Champion Charlotte Flair looks to stop the momentum of challenger Ruby Riott. Randy Orton tries to capture the United States Championship for the first time in his career when he faces champion Bobby Roode. The race to WrestleMania begins at Fastlane! 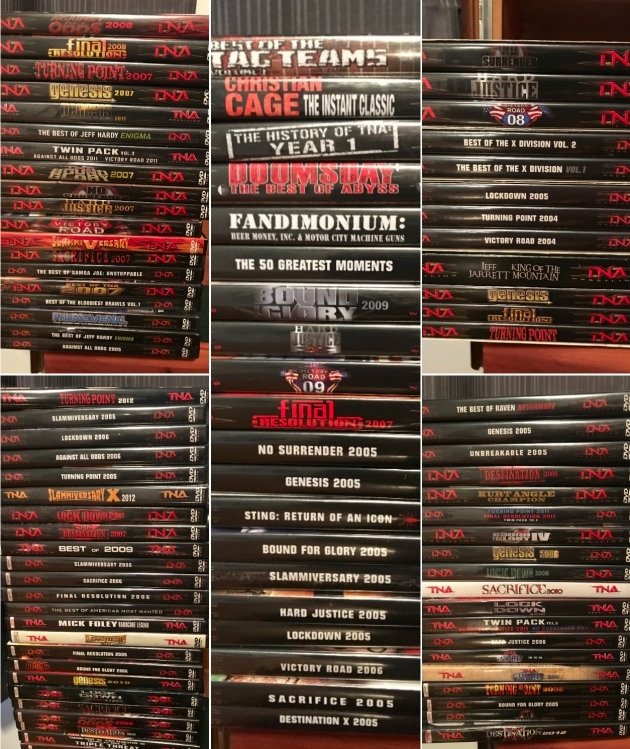 Speaking of TNA earlier, longtime reader of the site Jeff Evans would like to give a WDN reader first refusal on a massive collection of 95 TNA Wrestling DVDs he is selling. If you’re interested in the lot Jeff would like you to either email him at jcruiser85@aol.com or get in touch via Twitter searching for @Jcruiser85. Tell him we sent you and grab yourself a deal! I wonder why they decided to stop selling these ‘DOUBLE PACK’ pay-per-view events? Because that’ll mean they’re going back to selling these events as 1 d.v.d releases. Which means next month’s ‘BACKLASH’ will be released on d.v.d starting in june and ‘MONEY IN THE BANK’ will be released on d.v.d in july. I personally liked the ‘double packs’. They only started selling the double packs because they were running 2 PPVs a month following the brand split. Now they’re back to 1 PPV a month, so there’s no need for the double packs anymore. For those interested TNA (or Impact Wrestling) have released Slammiversary 2017, Bound for Glory 2017, GFW Amped Anthology Part 3 and Part 4 on DVD available on their website. Also from what I read looks like TNA published those four DVDs on DVD-R as some people that bought those have said the back of the discs are purple instead of the usual silver and look like bootlegs, not official pressings. Seems like a another cost cutting measure. Jeez… DVD-R? I thought WWE was bad cancelling blu-rays for the most part, but TNA selling DVD-Rs is a bit of a mess. I find their covers to often be really artsy looking and nice. Hard to believe under that artwork is a DVD-R.
That is very disappointing to hear! And TNA DVDs cost like £14.99 GBP in the UK per pay-per-view, which is WAY too much to be paying for a DVD-R.
How much is the TNA lot? I’m really genuinely happy to see a working relationship of sorts between WWE and Impact, even if only for a DVD release. It’s cool to see both companies get past any pettiness and to see Impact footage used in the same way that ROH, CZW and Dragon Gate footage has been used on WWE releases. Also interesting to see WWE giving a genuine shot in the arm to the GWN. Looks like WWE isn’t that averse to the idea of other companies’ survival being good for the business. This also bodes very well for an AJ documentary! It’s a shame this wasn’t happening previously for the Sting and Dudley Boyz docs. For sure agree. I think a positive relationship between the two companies is certainly a good thing and I hope it can lead to additional business in the future. Back in the day when TNA were at their prime, I always hoped for a cross-promotion event or PPV the way WWF did with Japan’s SWS in the early 1990s. Also with WWE plugging their streaming service GWN will most likely help them increase subscriptions. So its a win-win for both companies – WWE can use the footage and Impact gets the exposure and attracting new fans.